Eli B. Votaw, Jr, 94, of Wellfleet, NE, died Oct. 30, 2012, at Lincoln, NE. He was born on Oct. 13, 1918, at the ranch his father had homesteaded in 1884. He was born to Eli B. Votaw and Clara Grace Swink Votaw of Wellfleet, NE. In 1937, The Angus Journal had an article about a Nebraska boy who had traveled to Iowa and purchased "the very best heifer of the auction". This was the beginning of Eli building his nationally recognized registered Angus herd. In 1975, Eli was elected to the American Angus Board of Directors. While serving his two terms on the Board, he was instrumental in establishing the internationally recognized Certified Angus Beef Program. For 30 years, E Bar V participated in a work study program with the University of Nebraska School of Agriculture in Curtis. In 1992, he was honored as the Lincoln County Feeder Rancher of the year. He was a 60-year member of the Nebraska Cattlemen Association serving on various committees. 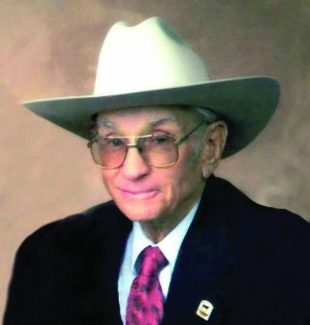 He was also a long-time member of the National Cattlemen Association. Eli was also a life-time member of the American Angus Association and the Nebraska Angus Association. Eli served as a Delegate to the Annual meeting of the American Angus Association National conference for decades. Two cherished accomplishments were bestowed upon Eli, and his wife Bette in recognition of their contributions to the improvement and advancement of Angus in the United States. They were inducted into the Angus Heritage Foundation in 1999, by the American Angus Association and in 2006, the Nebraska Angus Association presented them with the Nebraska Pioneer Producer Award. Those left to cherish his memory are his wife Bette, two daughters, Kathy (Louis) Dubs of Billings, MT, and Kerri (Steven) Kliewer of Henderson, NE. Grandchildren: Merici Vinton (Dominic Campbell) of London, England, Katrina (Adam) Petersen of Cheyenne, WY, Allison Dubs of Lincoln, NE, Chase Eli Kliewer of Omaha, NE, Garrett Kliewer of Lincoln, NE, and Mariah Kliewer of New York City, NY. One brother Bill Votaw of North Platte and many nieces and nephews. Preceding him in death was his beloved daughter Christine Sue Votaw Vinton, son-in-law Patrick Donald Vinton, his parents, and siblings: Lillie Mae Votaw Shanafelt, Ella Votaw, Janet Votaw Zezula, John Robert Votaw, Abner E Votaw, Amy Grace Votaw and Delmar William Votaw. Services will be held Thursday, Dec. 27, at 10:30 a.m. at the First Evangelical Lutheran Church in North Platte, NE. Burial will be at the Fort McPhersen Cementary with some ashes scattered on their E Bar V Ranch.